Lock in a great price for Martini – rated 9.2 by recent guests! We arrived early evening and the host was waiting for us!! Host was very friendly and helpful - facility was very clean and a prefect fit for us. Pretty big room with everything you need. Owner even brought some fruites, cookies and milk. Very friendly host she is a amazing and very helpful. Very clean place. Nice outside sitting area for relaxing. I can highly recommend this place for a peaceful and safe stay. Very nice. I booked late in the day while hiking the Israel National Trail and had no problem checking in. The room had fruit and treats. She even brought me some chips and yogurt. Fantastic hospitality at this place. Also very clean and comfortable. Nice big studio. Clean and well serviced. Extra touch from the owner. Totally hospitable owner! Welcoming reception with fruits, milk and buiscuits! Thank you! It was appreciated! Огромное спасибо хозяйке, Мартине, за теплый прием. Все рассказала, про пляж, парковку, дала несколько мелких монет для оплаты парковки на пляже. Конечно место оптимально для отдыхающих с автомобилем. Сейчас ведется строительство новой дороги между Неве Зоар и отелями с бесплатным пляжем, будет полегче добираться и пешком. Спасибо за отличный интернет. Мартини еще раз огромное спасибо за отличное проживание. Котейкам приветы. 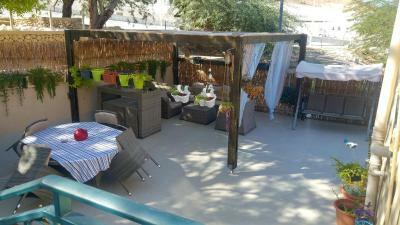 Martini is located in Neve Zohar and offers barbecue facilities and a terrace. This lodge has air-conditioned accommodations with a balcony and free WiFi. This lodge comes with a seating area, a kitchen with a microwave, and a satellite flat-screen TV. The lodge also provides a bathroom with a shower. Ein Bokek is 5 miles from the lodge, while Ein Gedi is 23 miles from the property. 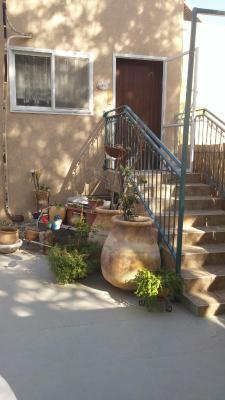 This property also has one of the top-rated locations in Neve Zohar! Guests are happier about it compared to other properties in the area. When would you like to stay at Martini? This quadruple room features a balcony, sofa and kitchenette. House Rules Martini takes special requests – add in the next step! Martini accepts these cards and reserves the right to temporarily hold an amount prior to arrival. Please inform Martini of your expected arrival time in advance. You can use the Special Requests box when booking, or contact the property directly using the contact details in your confirmation. 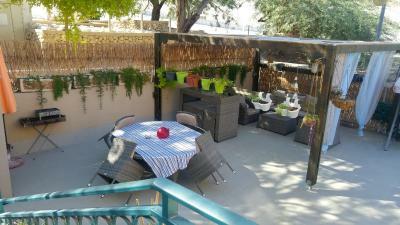 Great location, spacious and nice terrace. There wasn't anybody to check in, and they didn't answer the phone to let us know what to do. The "grill" was one that can be bought in a gas station. The refrigerator's door didn't close so the food and drinks were not cold, the bath curtain fell down and the electricity went out the second night, no A/C on am extremely hot weather. Owner never to be found by telephone all weekend, and not present on the second day either. nice staying. the owner is very nice!